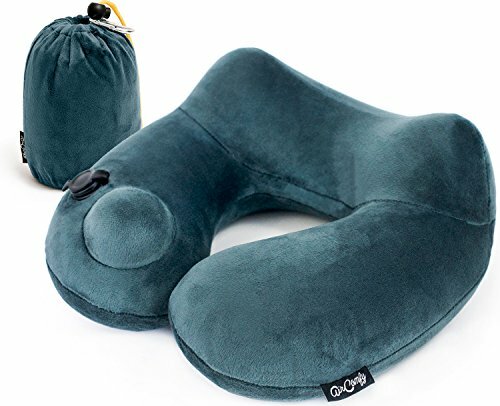 Whether you are traveling or sleeping at home, this guide will cover the best neck pillows for your need. There are many good reasons for owning one. One particular reason is if you plan on traveling frequently. Having trouble with snoring? Unlike regular pillows, the pillows designed to stop snoring come in unique shapes that provide a different angle for your head to rest against. For more information, check out our buyer’s guide on the best anti-snoring pillows. Who is it intended for? Depending on who will be using the pillow, you may want a particular design. For example, children may enjoy animal or Disney character design while adults may prefer a particular color. What shape are you looking for? There are two types of designs: cervical designs that are the flat rectangular shapes and are made for upright resting. For the upright use, you can have a simple, rectangular cushion or the U-shape frequently used by travelers. What is your available budget? Typical price range is between $15 USD to as much as $100. A cervical shape meant for sleeping on your back or side will be priced higher than other regular designs. Are there any other items you would like to purchase? In airplane flights, it may get a little chilly with air condition turned up so you may want to include a blanket in your Amazon order. You may want to also include a sleeping mask or earplugs for a complete set for a solid sleep. There are many different shapes and aesthetic designs available on Amazon. We did the work, and found the best possible pillow for many different needs. The Travelrest is an inflatable, lateral support pillow for the upper body and neck. Used for long car rides or flights, this product can be worn like a seat belt, and can be inflated and deflated through a mouth piece. When deflated and rolled up, the dimensions are 2-inch by 9-inch by 3.5-inch and weighs only 7 ounces for a compact storage such as your glove box or center console. The material is flocked PVC that is for easy wash and dry. A separately sold removable zipper cover is also available for protecting the Travelrest for a longer-lasting use. . The Travelrest comes with a 2-year warranty and is available in 4 colors: blue, red, grey, and moss (green). A key advantage to this product is that it does not need to be wrapped around your neck like traditional U-shaped, pushing your head forward unnecessarily. There is also a rope to fasten the Travelrest to the head of your car seat or around the thick cushion of your airplane seat. The backside is non-slip for holding it in place. 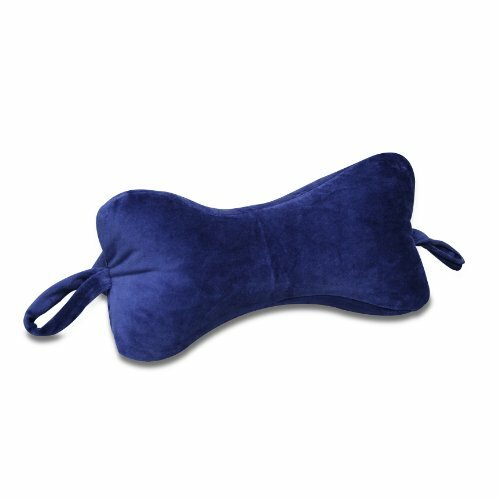 The Coop Home Goods is a memory foam travel neck pillow that is 40% bamboo derived viscose rayon and 60% polyester. It uses a shredded CertiPUR-US certified memory foam with a removable bamboo derived cover for easy washing. This product has a fully adjustable feature for adding or removing foam for a thicker or thinner shape depending on your preference. It is hypoallergenic, dust mite resistant, and comes with a 30-day no questions asked refund. The inner lining is made from Interlock for a tight knit and smooth surface. The Coop Home Goods is made in the USA and comes in 3 available sizes: standard, queen, and king. Standard size is 20-inch by 26-inch. Queen size is 20-inch by 30-inch. King size is 20-inch by 36-inch. The mix of shredded visco elastic memory foam that can be added or subtracted from the filling is a patented blend that can only be found by purchasing the pillow from Coop Home Goods. This blend of foam provides the loft and support your head. It is highly breathable and allows for airflow for a cool, comfortable sleep. The Mediflow Original Waterbase is a cervical pillow for neck pain. It is an adjustable design with cotton material and a thick polyester fiber that covers a thermal insulator that holds a waterbase. The firmness can be adjusted by the amount of water added. The product is made with a soft, hypoallergenic fiber with a 5-inch thick top lyaer and has a easy-to-fill water pouch. It also comes with detailed instructions on how to use and clean, and remove air pockets in the pouch. The Mediflow Original Waterbase comes with a 30-day return guarantee and 1-year warranty against defects. 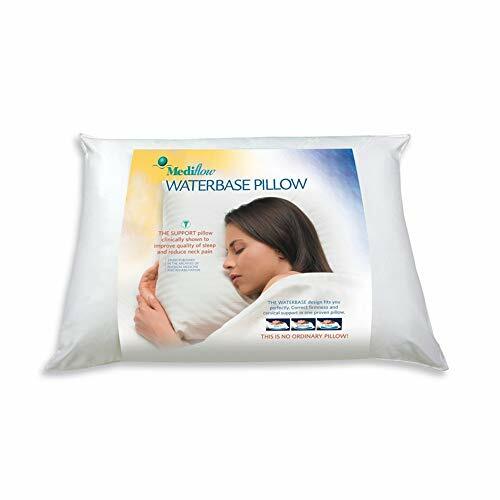 One great benefit of using the waterbase pillow is its fast-response to adjusting to your head and neck position. This is very helpful for those with neck pain or soreness. The dimensions are 20-inch by 28-inch and made in the USA. It is also machine wash and dry friendly. 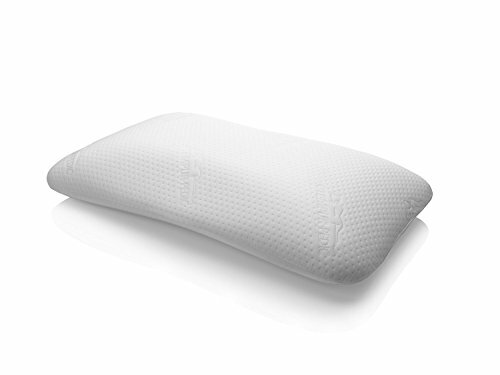 The Tempur-Pedic Symphony is a tempur-pedic neck pillow with soft and plush surface with a medium-firm feel. It is made with TEMPUR material, only available with Tempur-pedic brand. The sides are gently arched to provide a support to maintain the head and neck on any sleep position. The removable cover is made with 80% cotton, 17% polyester, and 3% elastane (spandex). The Tempur-Pedic Symphony can come with a 3-year accidental protection warranty from manufacturer defects. The dimensions are 17-inch x 25-inch x 5.5-inch. The tempur material design has been recognized by NASA and certified by the space foundation as the bedding product for astronauts. It is also recognized and recommended by the Arthritis Foundation for ease of use and comfort for people with arthritis. 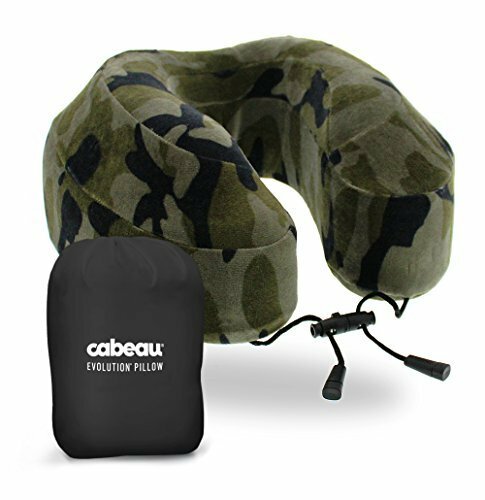 The Cabeau Evolution is a popular on Amazon for both traveling and sleep. 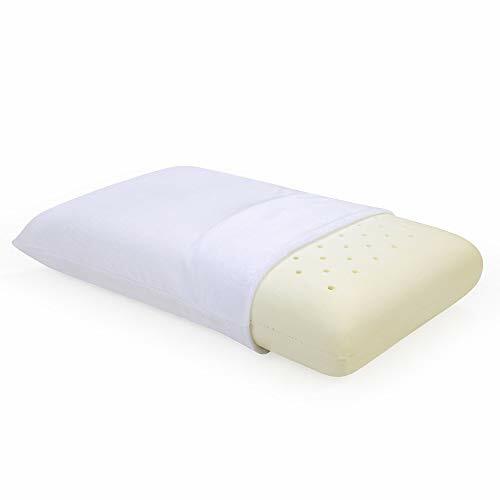 With over 2000+ customer reviews and a 4+ star rating, this makes it one of the best (and lowest priced) pillow on Amazon. The backside is flat and thin to accommodate headrests for seats on a car, airplane, or for laying flat in bed. It is made with a high-quality velour exterior, a responsive memory foam inside, and includes a removable cover that can be washed. The Cabeau Evolution is available in 10 different colors. The AirComfy Daydreamer is a 360-degree pillow travel packsack with push-button built-in inflating pump without the use of mouth-blowing. There are raised arch that holds your head upright to relieve pressure on the neck and shoulders. Since it uses air compression, you can adjust the firmness to your preference without removing it from your neck. The product also comes with a soft micro-velvet zipper case that can be removed and washed as needed. It also comes with a satin-lined packsack with a clip for attaching to the outside of luggages. The AirComfy Daydreamer is the go-to pillow for travel. 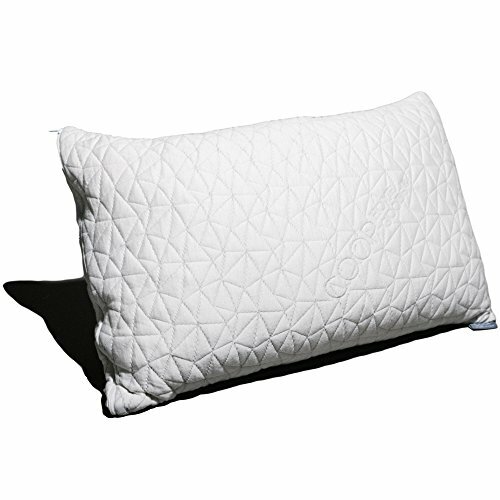 The Classic Brands Comforma is one of the favorite pillows for using to sleep. A cotton blend with soft velour cover with hypoallergenic memory foam interior creates a medium-firm feel that is not fully plush but softer than a firm comfort level. The memory foam filling has an open-celled structure that allow airflow and self-ventilation to keep your neck and head cool during sleep. It is dust mite resistant, antimicrobial and resistant to allergens, mold and bacteria. The cover is removable and washable. The Classic Conforma is 5 inches thick and available in two sizes: queen and king. The Original Bones NeckBone is a unique, minimal design pillow made of soft, washable cloth made from soft velour fabric. It takes very little space, can be hung around your neck or suitcase handle easily, and is unlike the odd-shaped typical U-shape designs. It is made with hypoallergenic polyester and has a zipper for access to add and remove polyester to your preferred comfort. It is 14.5-inch by 6.5-inch and available in four colors. Although it does not go around your neck, the Original Bones NeckBone has side handles that can be grasped on for adjusting. The Disney Frozen is a popular pillow for kids. There are four u-shaped designs available of favorite Frozen characters. They are soft, plush feel made from 100% polyester microfiber. They measure 11-inch by 15-inch and are spot clean only. 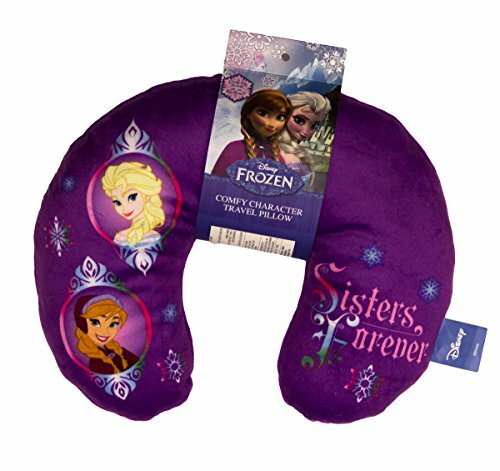 With such a fun, printed design, little fans of Frozen will love and adore this product. There are also five buddy designs available on Amazon. They include the Frozen sisters Anna and Elsa, and snowman Olaf. They are roughly two-feet tall. This is popular pillow for young boys. 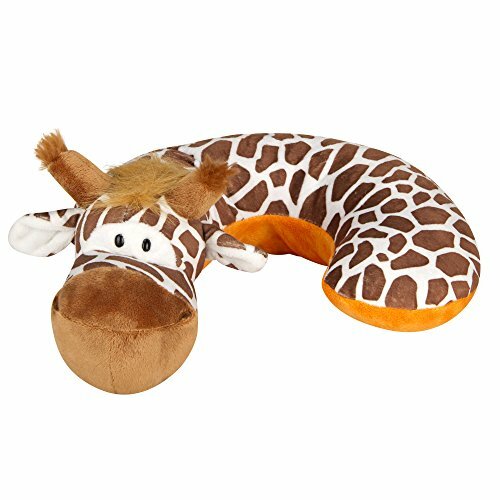 This brown, white, and orange giraffe U-shape design that is 5-inch high by 10.5-inch wide. Designed to support sleepy heads, they are perfect for use in car seats, strollers, planes, trains, and more. The fabric is soft and plush, machine-washable, and intended for children 1 year and older. 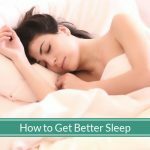 Getting physical pain from using your pillow? 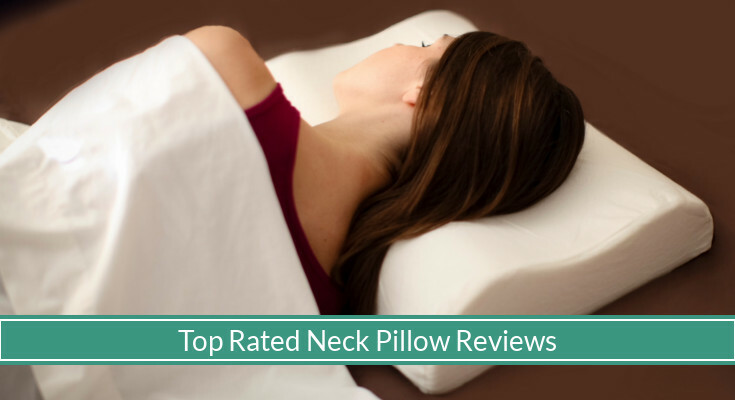 We wrote a separate guide that covers the top rated best pillow for neck and shoulder pains. This buyer’s guide focus on the pillows that relieve pressure and have had the most positive reviews and ratings on Amazon. There are many types of neck pillows we covered in this guide. When shopping for one, take the time to go through our considerations list so you can find the right pillow for your need. 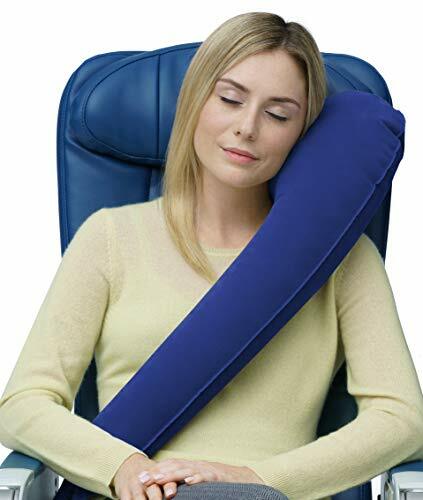 The U-shape design is not the only travel design available, nor should cervical shapes be considered only for sleeping flat on your back or side. We hope this guide finds you well and you can find the best pillow for the most comfortable, neck support and use.